This month’s Jo-Ann Fabrics Celebrate the Season theme is Fabulously Festive. I thought it was the perfect theme for a craft I’ve been meaning to do since Halloween. This is a sponsored post, but all opinions are mine. 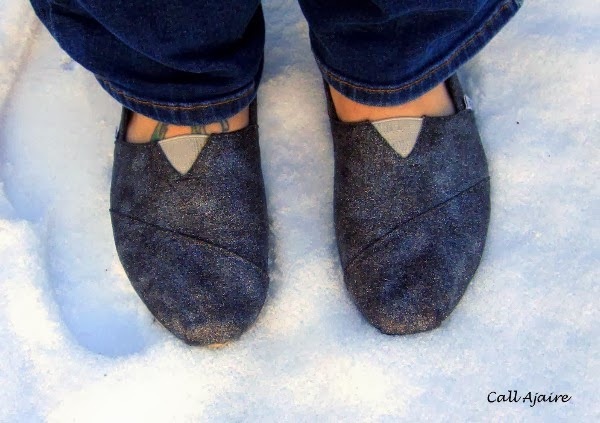 I broke down and bought a pair of Toms this summer and they quickly became my favorite go-to shoes. The light grey was perfect for summer, but I they didn’t translate well to fall and winter. Then after the pouring rain and muddy mess of Halloween night, they didn’t look so great so I decided to buy a new pair for the winter months. After seeing some fun fabric glitter from JoAnn I thought I could try altering them myself before buying a whole new pair. So here is what I started with. Even after a good cleaning they look dingy, right? I scrubbed them up pretty good, but now you see why I planned to buy a new pair. 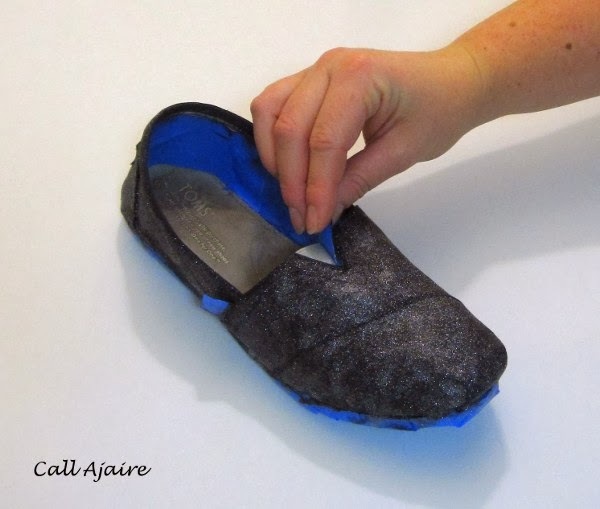 The good news is that this would work even on a new or gently worn pair of fabric shoes so you don’t have to wait until yours are at this stage, hehe. Since the tear didn’t go through to the inside of the shoe, I used some Fray Check to prevent the tear from getting any worse, which should keep everything together for a while. I was concerned how well the paint and glitter would cover the Fray Checked area, but it worked a treat. 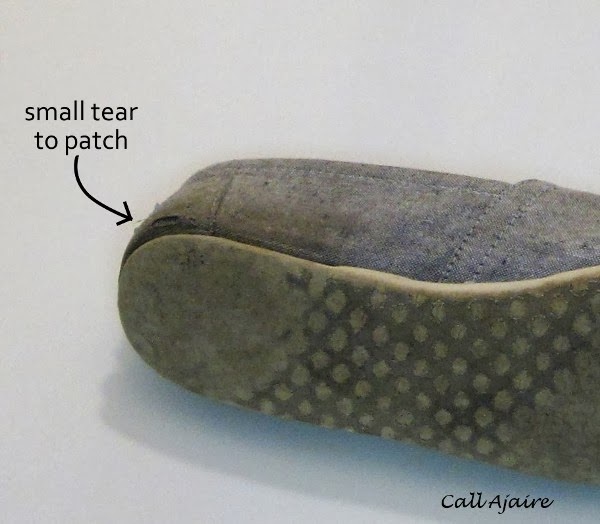 I would definitely recommend this method if you have any fraying on your shoe. To start make sure your shoes are washed clean of all dirt and fully dried. Using painter’s tape which is easily removed, tape all the spots you don’t want covered in paint (or glitter). Since the inside of my shoes were already worn, I wasn’t too worried about paint getting to the spots that wouldn’t be seen once I had them on. If yours are newer I would recommend filling the space with tissue or newspaper. 1. Mix your paint with the Fabric Medium according to the bottle directions. Paint the entire shoe being careful not to miss any spots. Since you are painting on fabric, some of the paint will absorb immediately so make sure you wait a minute and check for any tiny spots that need another drop of paint. 2. Allow your shoes to dry at least 8 hours. The bottle recommends 24 hours, but since we have another step, the 8 hour window is enough. 3. 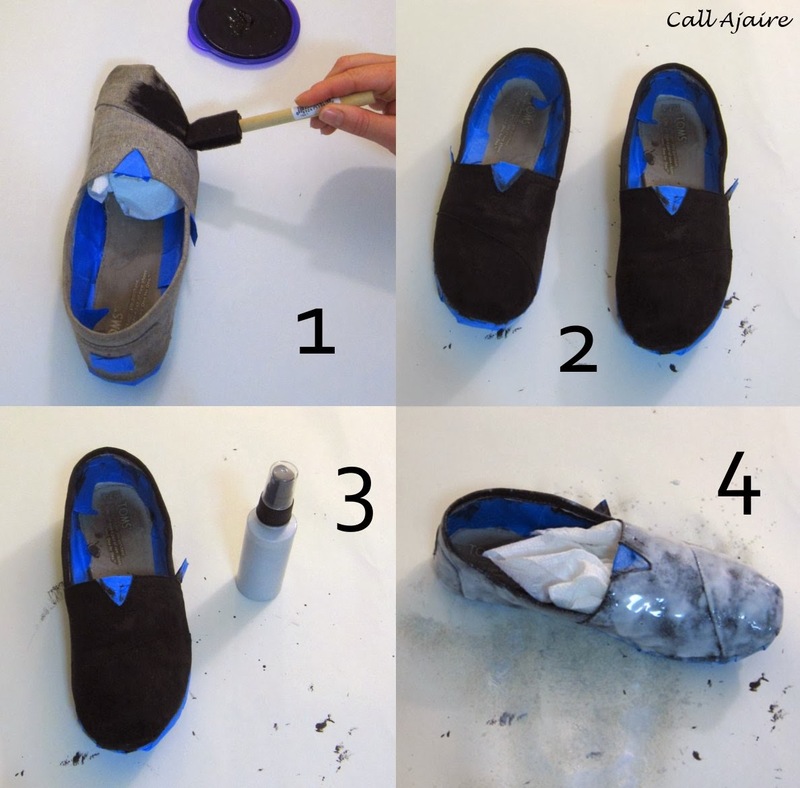 Using a bottle of the Glitter Fabric Spray Paint spray the entire shoe. 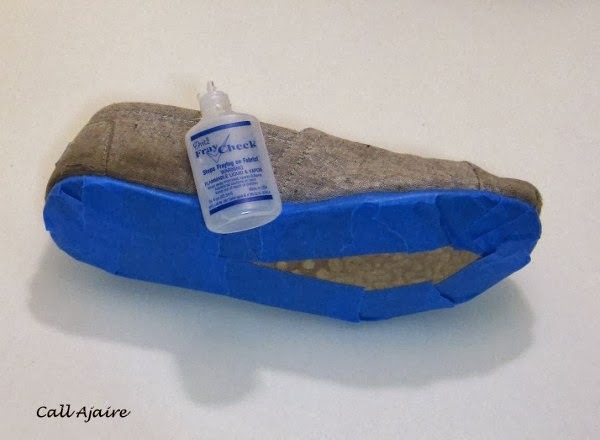 For this step I did use some tissue on the inside because I wasn’t sure if the glitter would stick to my feet later (spoiler alert: it wouldn’t!). 4. Heavily soak the shoe with the Glitter Fabric Spray Paint. At this point I was nervous that these would turn out a gloopy gloppy mess, but I wanted them fully covered so I sprayed and sprayed. Wait another 8 hours and check to see if the shoes are dry to the touch. If they are, then it’s a good time to remove the tape. If you wait too long to remove the tape it can dry into the paint which makes it really tough to remove without damaging the painted area, so you want to remove it even if it’s a little tacky still. Once the tape is fully removed, let the shoes dry completely. Since the Fabric Medium says to heat set the paint once dry, I put the shoes in a pillow case and ran them through a hot dryer. You could try an iron with a pressing cloth if you are worried about your shoes shrinking in the dryer. Mine turned out great. Tada! It’s hard to picture just how sparkly and wonderful these shoes are, but you’ll have to trust me. I am completely in love with my new Festive Toms. The black paint shows through enough to make the silver glitter really stand out. And all of the paint and glitter glue seemed to incorporate into the fabric because there is no stiff paint feeling at all. Seriously. 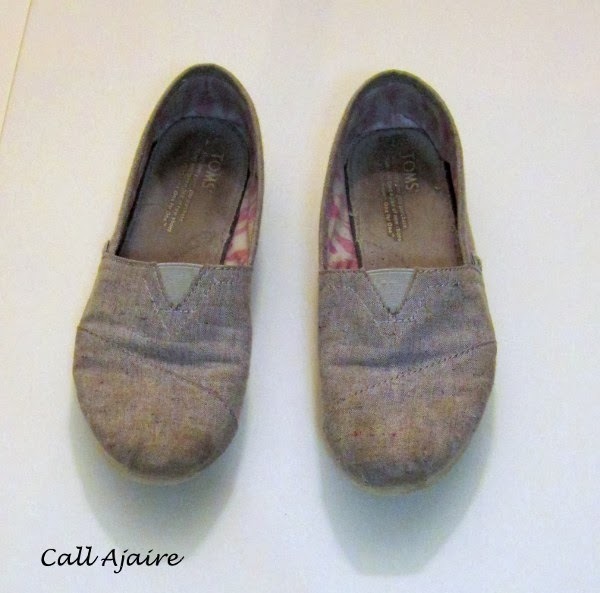 These nicely worn in Toms feel exactly the same as they did before I started. It’s kind of magical. And the best part? The glitter stays put! These are my hands after pulling off all of the tape which meant I was rubbing them all over the glittery spots. 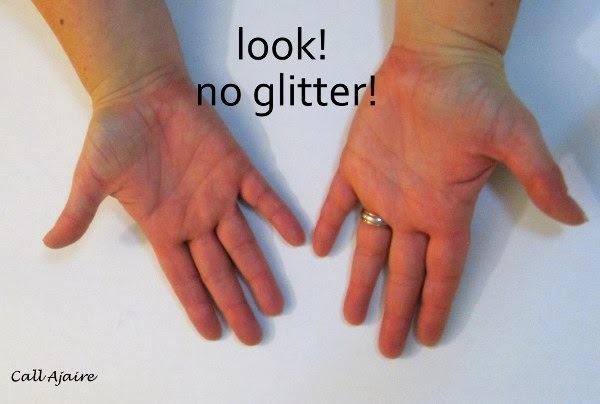 Absolutely not a speck of glitter. I’m pretty shocked actually. Look at how great these shoes are now! From completely trashable to fun and festive. I have pretty much not taken them off since I finished them last week. They aren’t the smartest snow shoes, but they sure are pretty, hehe. 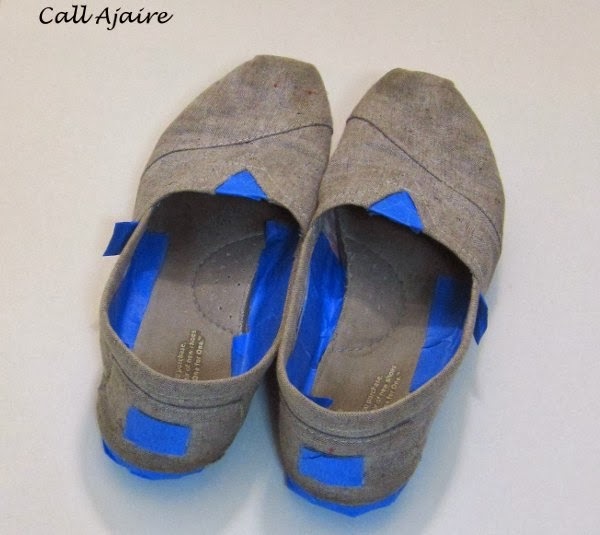 If you want to make some of your own (think really fun little girl holiday shoes!!) 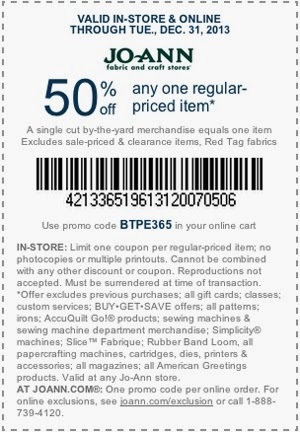 you can use this coupon to get 50% off through December 31st. 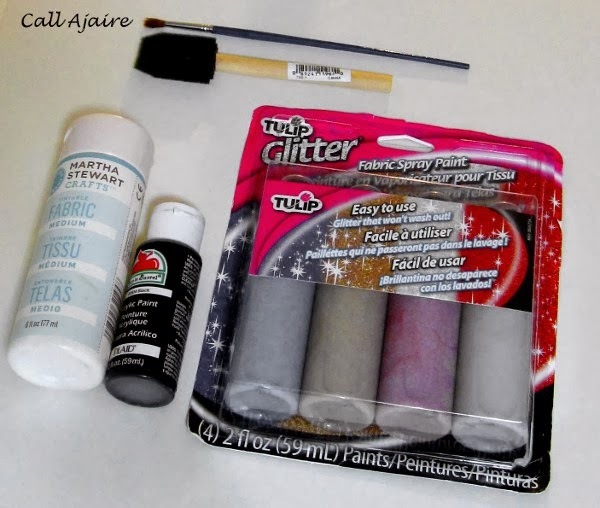 I’ve known for a while how great the Martha Stewart Fabric Medium works, but this Tulip Fabric Glitter Spray Paint is my new favorite. And for other Fabulously Festive inspiration check out JoAnn’s Simply Creative Christmas catalog or visit the Celebrate the Season page. You can also look for the hashtag #fabulouslyfestive to find this and other projects on Twitter, Pinterest, Instagram, and Facebook. This holiday we are definitely living the #alltheglitter lifestyle. These would fit right in! I'm most impressed that the glitter isn't coming off. I'm currently fighting with glitter that came off a Christmas card we got in the mail and it's EVERYWHERE.